Corn snakes (Elaphe guttata guttata) are one of the most available snakes in the pet trade today. 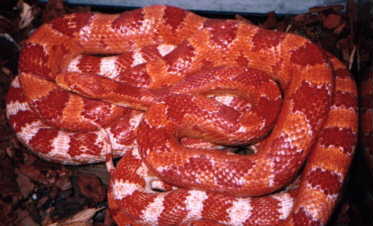 Vast numbers of corn snakes are captive bred annually, and are justifiably one of the most popular snakes of all time. 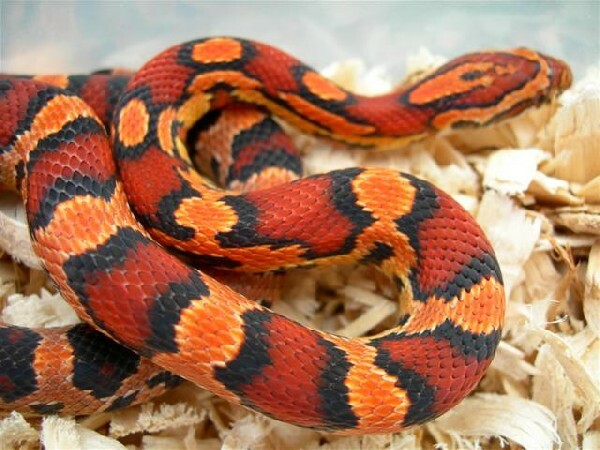 Corn snakes are relatively small, rarely exceeding five feet in length, active feeders, tolerate a wide variety of environmental conditions, come in a dazzling arry of color morphs, and are very easy to breed. All of these factors combined make the corn snake an excellent choice for both the beginning and advanced reptile hobbyist. Corn snakes are relatively small, and as such, they do not require large enclosures. A baby corn snake can happily live in a ten gallon aquarium or enclosure of similar size. Some people choose to keep baby corn snakes in plastic shoeboxes with holes punched in the side. This type of enclosure is acceptable as long as appropriate heating is provided. Upon reaching full adult size (about three to four years), a corn snake will require an enclosure with the minimum dimensions of a standard twenty gallon long aquarium. Larger aquariums such as a thirty gallon breeder or fifty-five gallon tank are also appropriate. No matter whether your corn snake lives in a humble home or a palace, there are several important details to keep in mind when setting up your new pet. The substrate of a cage is the material that is on the bottom. There are appropriate and not so appropriate choices of substrate in corn snake housing. Cedar shavings are unacceptable as they cause respiratory problems in snakes. I personally do not recommend pine for the same reason, but others have used this substrate without any problems. Corn cob bedding (manufactured for use with birds) should not be used as a substrate because it causes excessive drying of dermal tissues and can cause serious intestinal blockage if swallowed. Acceptable substrates include reptile bark, butcher paper, paper towels and Astroturf. Reptile bark can be purchased in pet stores, and is attractive and natural-looking. Butcher paper can be acquired in many places such as home depot or art supply stores. This substrate, while not particularly attractive, allows one to keep the cage very clean by continuously replacing the soiled paper. Paper towels have the same advantages and disadvantages of butcher paper. Astroturf can be used, but it does tend to rot easily if wetted, so it is best to have several pieces cut to fit the cage so you can rotate dirty and clean pieces. There are several choices for appropriate corn snake heating. Whatever choice of heating is used, it is very important to provide one area of the cage where the ambient (air) temperature is 80-85 degrees F. Corn snakes, like all reptiles, do not make their own body heat and rely on a behavioral mechanism called thermoregualtion to regulate their body temperature. Thermoregulation means that when a reptile is too cool, it moves to an area to warm itself, and when it is too hot, it moves to a cooler area. 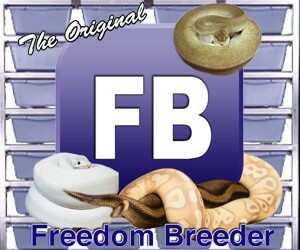 Access to warm areas are critically important to the health of your snake. Appropriate heating is required for proper digestion and the effective functioning of the immune system. If the tank has a screen top, a shop light or metal reflector may be placed on top of the cage, to one side, with a heating bulb inside to create a basking area of 80-85 degrees F. Another method of heating is the use of quality undertank heating pads. Undertank heaters are plastic with one adhesive side. The adhesive side of the heater is used to attach it to the bottom of the outside of the tank, on one side of the cage. These heaters can only be used with certain types of cages, so check the directions before purchase. Hot rocks are not recommended for corn snake heating for several reasons. Hot rocks provide a localized heat source that is often too hot. As a result, the snake will curl itself about the rock in an attempt to raise its body temperature, this can result in serious thermal burns. Think about this from the snake's point of view. One tiny area of the cage is 100 degrees F, and the rest of the cage is freezing. Without some type of heat, reptiles will get sick, so the animal will use whatever source of heat is provided, even if it is too hot. Some of the new hot rocks that have thermostats are a much better choice if a hot rock must be used. If not, at least burying the hot rock in some substrate will help to diffuse the heat. It is much better to provide indirect heating, or heating that the animal has no direct access to. This will prevent thermal burns from occurring. Corn snakes are rarely picky eaters if they have the proper heat and enclosure. One important aspect of feeding that is often overlooked is the addition of hiding areas to the cage. Corn snakes, like most snakes, like to feel secure in their environment. One way of providing for this need to is put hiding spots in the enclosure. Hiding spots can be made of anything, as long as the snake can completely fit inside the area and hide itself from view. Old cardboard boxes are good for this, but so are many of the commercially manufactured hiding spots available in pet stores. A hiding spot should be placed both on the warm end and the cool end of the cage, so that the animal can feel secure in any spot. Corn snakes kept without appropriate hiding areas become stressed and may refuse to eat. 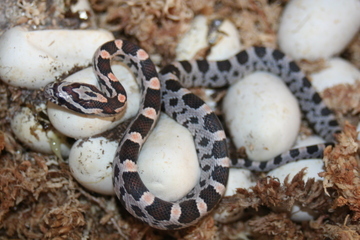 Hatchling corn snakes begin eating pinky mice, and progress up to adult mice once they are mature. A good rule of thumb is to feed the snake a food item that is the same, or close to, the snake's diameter. Feed an item that is too large, and the snake will often regurgitate it. Snakes will also regurgitate if they do not have a warm area or if they are handled too soon after they eat. Corn snakes can be fed two times a week, but once is usually enough. Clean water should be available at all times, corn snakes drink often.